Recently I have been working painting with my encaustic wax on some patterned papers I bought from a local craft shop and they have a very different effect so I thought I would show some here today. These design papers have an abstract print in what, I feel are rustic / distressed / shabby paper chic style. They are a 200gsm Matt paper support, unlike the encaustic card I mostly paint on which is a gloss. The gloss card allows the wax to move and flow, it allows for blending on the support. The Matt surface is porous so when the wax is on its on !! I blend colours before applying more and a little by reheating the wax once in place. It gives an interesting effect and the wax has a great contrast in texture to the paper background. 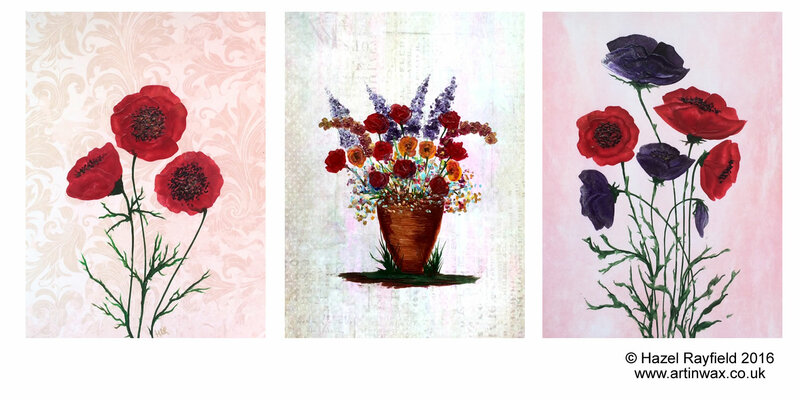 I have painted these three pictures : Red Poppies : Purple and red poppies : Flower pot in this style recently and as you can see the results are modern style pieces of wall art. Each of these paintings are 6 inches wide, and different heights I have cropped the photos for this blog post but they are for sale and I can send more information on sizes and if you would like them mounted or not. Please contact me for more details on how to buy Art in Wax. I have also painted some miniatures in this way using tiny pieces of these patterned paper. And in the next blog post I will show photos of me painting in miniature in this way. This is my latest encaustic wax painting. Painting in encaustic wax is great fun and a very versatile medium to work with. 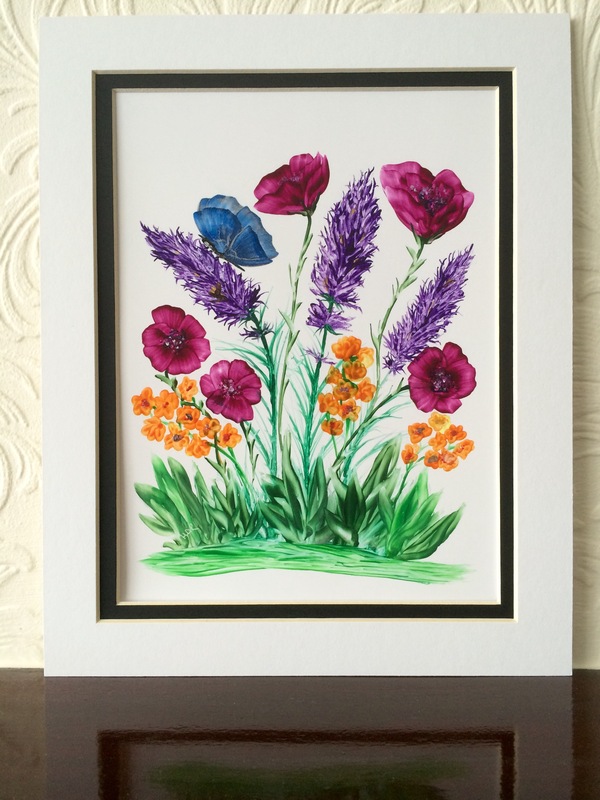 The medium lends itself to both the subtle tones and in this garden flower painting to the colourful and bold. This painting is painted in “Arts Encaustic” brand of hot wax paints on specialist card and shown here mounted in a double mount 10 x 8 inches. I have used both my iron and stylus tools to paint this picture which has an array of bright flowers and a pretty blue and silver butterfly. 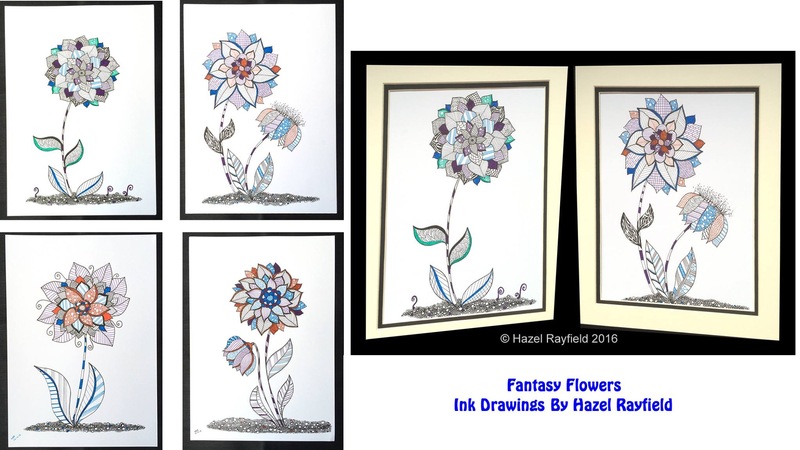 I have decided that I will offer some of my Zentangle inspired fantasy flowers for sale. If you are interested contact me direct please via my website. These four are each A4 in size and have been drawn using archival ink on white card stock. I have taken a couple of pictures of them in mounts to try out how they might look, these mounts are 10 x 12 inches so if mounting I would need to trim the picture to fit them. For just the drawing as is …. signed on the back and initialed on the front they will be £10 each plus postage. If you would like it with the mount as shown here (I only have one of these mounts at the moment – I have other styles too) let me know and I can quote you a price. Payment is via PayPal and we can arrange this when you contact me. Over the past few months I have been drawing and painting some new Zentangle inspired pieces, there is a blog post about these pattern style pictures, so I thought I would paint a small series of them as fantasy flowers to display on the Art In Wax Exhibit page, which I tend to change once or twice a year. This new collection of 4 A3 size pictures painted in my Encaustic wax are very different to my normal style of flower paintings. They are inspired by a new type of art I discovered a few months ago and which I am enjoying as part of my creativity, it is a drawing art form known as Zentangle. My own “doodle tangles” as I call them are based on this type of pattern drawing and the fantasy flowers have a patchwork style to them. A Zentangle originally was a drawing on a 3 1/2 x 3 1/2 inch piece of card, I like to doodle my pattern / tangles in different shapes, as many people do, my favourite being flowers, as you will know if you have read before I am passionate about painting flowers. 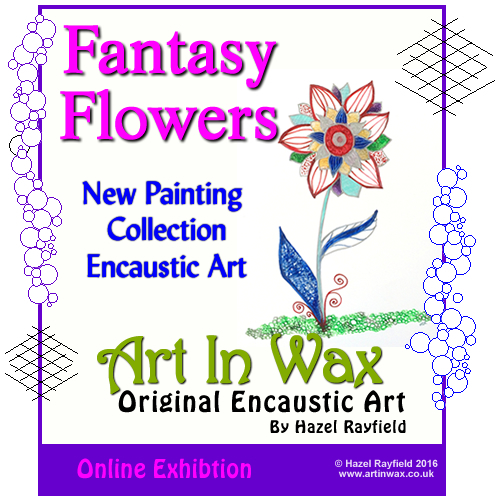 Buying Art In Wax – if you would like to buy one of these paintings or any others shown on my blog or website please contact me to see if they are still available.